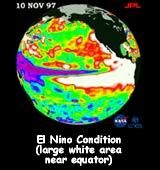 What is El Niño anyway? El Niño is a condition that sometimes occurs in the Pacific Ocean, but it is so big that it affects weather all over the world. Weather depends a lot on ocean temperatures. Where the ocean is warm, more clouds form, and more rain falls in that part of the world. In the Pacific Ocean, near the equator, the Sun makes the water especially warm on the surface. Normally, strong winds along the equator push the warm surface water near South America westward toward Indonesia. When this happens, the cooler water underneath rises up toward the surface of the ocean near South America. However, in the fall and winter of some years, these winds are much weaker than usual. They actually blow the other way (toward South America instead of Indonesia) in October. So the warm surface water along the equator piles up along the coast of South America and then moves north towards California and south toward Chile. Many fish that live in the normally cooler waters off the coast of South America move away or die. The fishermen call this condition of warm coastal waters and poor fishing "El Niño" meaning "the Christ Child," because in the occasional years it comes, it comes at Christmas time. In El Niño years, lots of rain clouds forms over this warm part of the ocean. These clouds move inland and dump much more rain than usual in South and Central America and in the United States. Meanwhile, other parts of the world can suffer drought. Weather patterns all over the world may be unusual, making lakes out of deserts and charcoal heaps out of rain forests. How do we know what is happening to the ocean temperatures around the Earth? The best way is to go up into space! How do you take the ocean's temperature from space? Where the ocean is warmer, sea level is slightly higher. In 2008, the Jason-2 satellite (also called the Ocean Surface Topography Mission) was launched into orbit around Earth. It continued the measurements being made by Jason-1, launched in 2001. Both satellites have a sensitive altimeter onboard. An altimeter measures height from itself down to the Earth's surface (land or water). 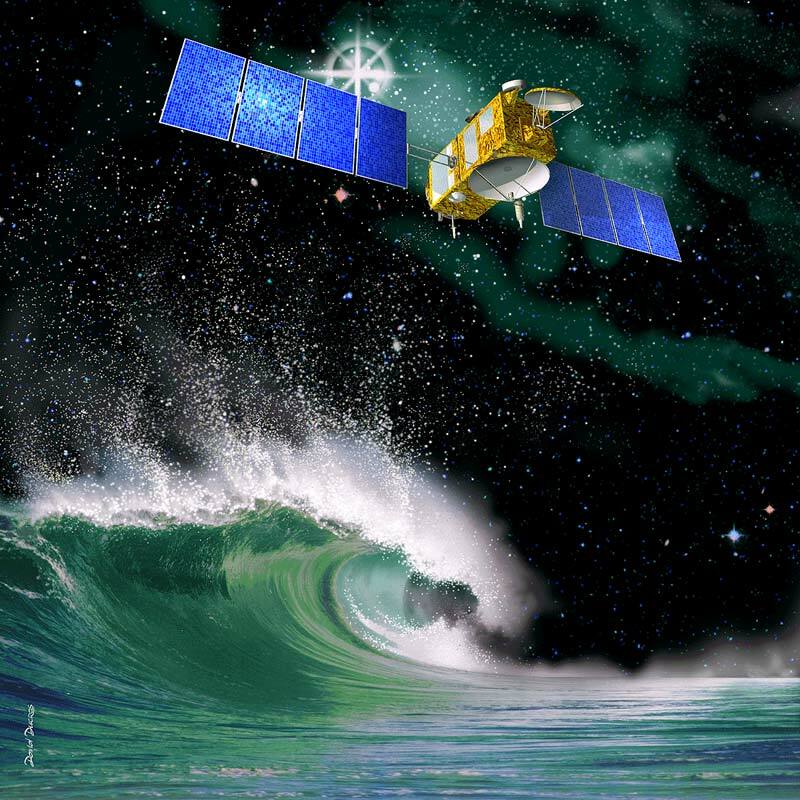 Jason-1 uses radar to measure the small hills and valleys of the ocean's surface. 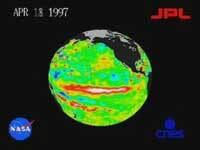 This information helps scientists understand ocean circulation and predict climate events such as El Niño. Jason-1 was launched in 2001 and is still working! Jason-2, also called the Ocean Surface Topography Mission, continues the work begun by Jason-1. Jason-2 was launched in 2008 and is still orbiting and collecting data. Using information from Jason-1 and Jason-2, scientists make topographical maps of the hills and valleys on the ocean's surface. The different heights of the ocean are shown on flat maps using different colors. In these maps, purple, blue, and green are the colder parts of the ocean where the sea level is a little lower. Red, pink, and white are the warmer parts where the surface of the ocean bulges upward a bit. The surface of the water where the ocean is warmest is only about 2 meters (a bit less than 7 feet) higher than in the coldest areas. Whip up some El Niño pudding! You have probably heard people blame "El Niño" for everything from bad weather to lost homework. Now we are going to "blame El Niño" for inspiring a delicious and colorful dessert! Here's the recipe for El Niño pudding. 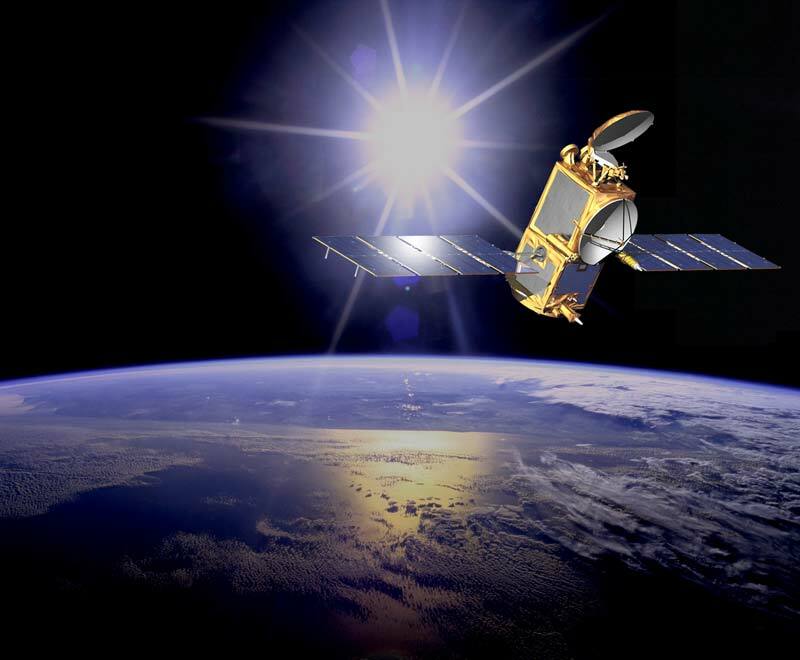 As you make your El Niño pudding, think about the Jason-1 and Jason-2 satellites. They are like minivans full of instruments up in space. They each go around the world 4,700 times a year making maps of the sea surface height. Jason-1 and Jason-2 are two of several satellites that keep an eye on our oceans and add to the information we get from ships and buoys. Watch El Niño in action! 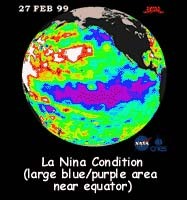 Here's a movie that shows the El Niño and La Niña conditions as they occur from December 1996 through January 2000. Watch the white bulge of warm water travel across the Pacific ocean. Get your Gummy Greenhouse Gases!